SANTA FE 789 CLASS BUILT BY BALDWIN. Built in Philadelphia in 1902 by the Baldwin Locomotive Works, #811 is the last of 23 such units of the 789 class. Between 1907 and 1910, it was changed from a four cylinder vauclain compound to single expansion cylinders. In 1923, it was converted to oil at the Topeka shops using some parts manufactured in Atchison. MISSOURI PACIFIC #121175 EAGLE MERCHANDISE CAR. This 40 foot car was used for less-than-carload merchandise between MP lines and Texas & Pacific freight stations. This car never interchanged with other railroads. 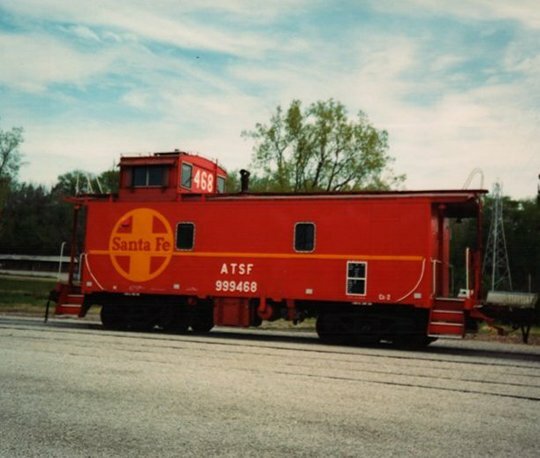 SANTA FE CABOOSE #999468. Built in 1928, it was rebuilt in 1975 and again in 1981. 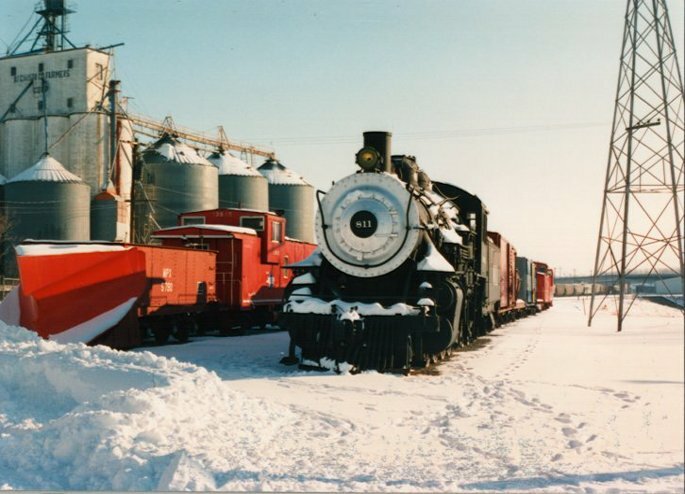 While the main use of the caboose was to serve as an office for the conductor, it also served as the supply department for the entire train crew. MISSOURI PACIFIC CABOOSE #13569, WIDE VISION. In the gaudy lexicon of railroad jargon, the caboose has more names than any other property in the work of the high iron. 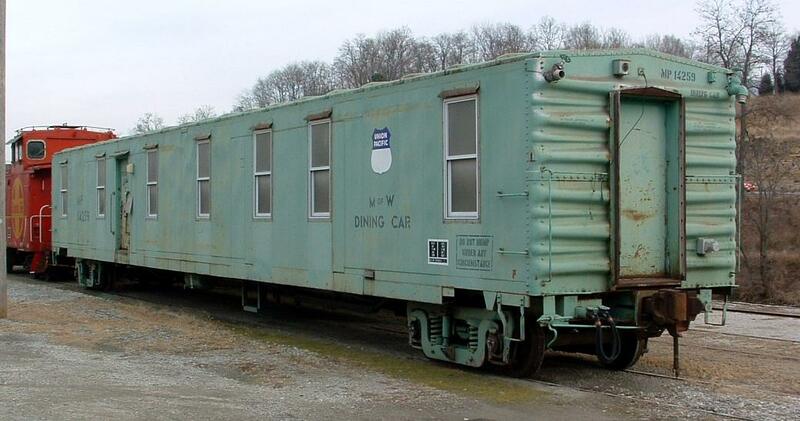 It is known as a caboose, crummy, way car, van, cage, doghouse, dronehouse, bouncer, bedhouse, buggy, chariot, shelter house, glory wagon, hack, hut, monkey wagon, pavilion, palace, parlor, brainbox, zoo, diner, kitchen, shanty, cabin car, and perambulator. There are probably others in a variety only bounded by limitations of human imagination. CHICAGO BURLINGTON & QUINCY RAILROAD POST OFFICE/BAGGAGE #1604 SILVER POUCH. The Q bought its first standard lightweight RPO/Baggage in 1940. Silver Pouch was the last such car purchased by the CB&Q. Built in October 1952, it went into service on the Kansas City Zephyr between Kansas City and Chicago on February 1, 1953. On October 28, 1956, Silver Pouch was transferred to Denver Zephyr service where it served for several years before returning to the KC Zephyr. In 1970, Silver Pouch was on the KC Zephyr on its way to Chicago when the cancellation of railway mail service was announced. Silver Pouch was placed in company service when Amtrak was formed in 1971. BURLINGTON NORTHERN CABOOSE #10410. Originally a CB&Q caboose. Future plans are to restore to the CB&Q colors. 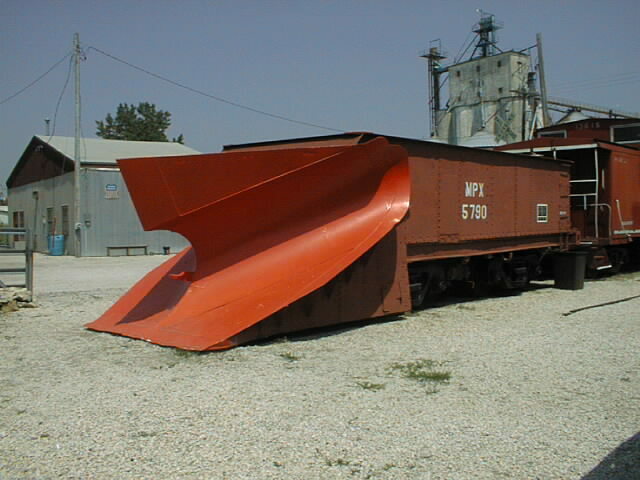 MISSOURI PACIFIC SNOW PLOW #MPX5790. One of six such plows built in the 1920’s at the MP shops in Atchison. The plow was built in 1928 using an ex-steam tender. This plow spent most of its service years on the MP Central Branch, showing up occasionally on the Omaha line. MISSOURI PACIFIC M of W DINING CAR #14259. The were a total of 50 built by the MoP at DeSoto in 1962, and were among the more unusual cars of the fleet, a 70-foot express car in the 135-series for express and mail handling in the 1960's. They were seen all over the system but their assignment was short-lived. Soon after thier introduction in the '60's, mail service switched off-rail and the express cars lost their major assignment. The Postal Service had changed contracts and went with the airlines. Due to a light-weight construction, the cars use for anything other than LCL service was very restricted. They were limited in general freight handling, thus those that escaped the dead lines were sent to MOW service earlier than thier contemporariesfound in a variety of MoW work. The Express cars that stayed in revenue service are long-gone, but those that survived can still be found in MoW service today working for the Union Pacific. Inside Length - 70' 0"
Inside Height - 8' 0"
Outside Length - 71' 3"
Extreme Width = 10' 3"
Extreme Height - 13' 7"
Door Width Opening - 9' 0"
Door Height - 6' 6"
For more info on the above car, click on this link. Last year we had one of our club member build a ballast car for the rail museum. Below are some photos of work in progress.